At the beginning and the end of the Twilight Zone film, Dan Aykroyd's catchphrase was "Do wanna see something really scary?" Well here is your humble correspondent earlier this evening on the front steps of the former Hillary Rodham home on Wisner Avenue in Park Ridge, Illinois. The Rodhams sold the home in the 1970s--the current owners weren't home, so Litte Marathon Pundit and I left there empty-handed. 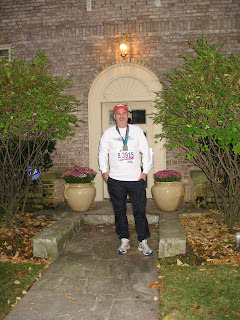 Oh, the costume is admittedly lame--a Chicago Marathon participant. But I'm wearing an authentic finisher's medal from the now-famous cancelled race. Now, for whom is this scary? The Clintonistas because I'm there. Or me, because, well, I'm there. Of course there is fright factor surrounding Hillary Rodham Clinton. A recent Associated Press poll found that among the 2008 presidential candidates, none other than the former Park Ridge "Goldwater Girl" (She peaked early) would make the scariest Halloween costume. Park Ridge, Illinois surrounded by farms? A Hillary fib? What goes around comes around. Fred Phelps's so-called religious group, the Westboro Baptist Church, has thrived as a going concern by winning lawsuits attemps to prevent their picketing. That's their fortress-like church in the picture, which I took three months ago. A federal jury on Wednesday awarded the father of a fallen Marine $2.9 million after finding a fundamentalist Kansas church and three of its leaders liable for invasion of privacy and intent to inflict emotional distress for picketing the funeral of a fallen Marine. 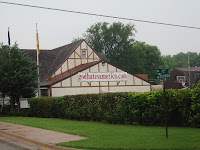 CBS station WJZ-TV reports Albert Snyder of York, Pa., sued the Westboro Baptist Church for unspecified monetary damages after members staged a demonstration at the March 2006 funeral of his son, Lance Cpl. Matthew Snyder, who was killed in Iraq. Church members routinely picket funerals of military personnel killed in Iraq and Afghanistan, carrying signs such as "Thank God for dead soldiers" and "God hates fags." A number of states have passed laws regarding funeral protests, and Congress has passed a law prohibiting such protests at federal cemeteries, but the Maryland lawsuit is believed to be the first filed by the family of a fallen serviceman. UPDATE Nov. 1: Actually, the Westboro folks have to pay up a lot more, $11 million. Arrgh! 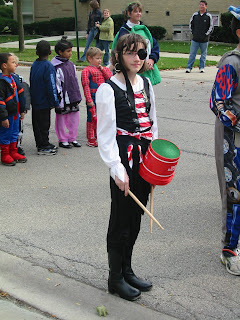 Yes, that's Little Marathon Pundit in the pirate costume--she not only participated in her school's Halloween Parade, but she played drums in the band too. Now it's time to go trick or treating. I'm dressing up this year--a rarity. I'm going to be a Chicago Marathon runner, complete with an empty water bottle. The train pulls out at Kankakee....Steve Goodman , "City of New Orleans." And that train, metaphorically speaking, is pulling out of George Ryan's hometown of Kankakee a week from today. The Seventh Circuit Court of Appeals rejected the former Illinois governor's request to stay out of prison while his appeal process runs its course. Ryan's only hope, and its a slim one, is if the US Supreme Court steps in on the Republican's behalf. In my opinion, you can put it on your timetable: George Ryan will be taking that train to the Federal Prison Camp in Duluth, Minnesota. It's over. Just what is Project Valour-IT? Project Valour-IT, in memory of SFC William V. Ziegenfuss, helps provide voice-controlled and adaptive laptop computers to wounded Soldiers, Sailors, Airmen and Marines recovering from hand wounds and other severe injuries at major military medical centers. Operating laptops by speaking into a microphone or using other adaptive technologies, our wounded heroes are able to send and receive messages from friends and loved ones, surf the 'Net, and communicate with buddies still in the field. The experience of MAJ Charles "Chuck" Ziegenfuss, a partner in the project who suffered serious hand wounds while serving in Iraq, illustrates how important these laptops can be to a wounded service member's recovery. Team Air Force Leader, Mrs. Greyhawk (of Mudville Gazette), along with Beth at Fuzzylicious Thinking, will be on the ANDREA SHEA-KING SHOW this evening at 9 PM ET (8pm CDT)--BlogTalkRadio. Together they will be talking about Project Valour-IT and the Air Force Team's strategy for victory. According to Mrs G, Project Valour-IT wouldn't be the success it is today without Beth's involvement, so we'll have some questions regarding her dedication to our wounded service members and Soldiers' Angels. Also, Mrs G was a guest of the POTUS at the White House back in September. Along with a few other bloggers, Mrs G was able to ask the president questions as well as give her input. Her historic meeting lasted for an hour, so naturally we'll be asking her about this experience. Later this week, Mrs G and Beth will be interviewed on Andrea's Sunday night show in Orlando on AM 580 WDBO--9 PM ET. The show will be streamed "live" on the internet, so make a note. I'll have more details and linkage later this week. The latest: The donations for Project Valour-IT are steadily coming in but we have a long way to go before we hit our combined goal of $240,000, so keep hitting the Donation button, and by all means continue aggressively spreading the word so others can donate. Complete info about the project as well as how to join a team is here. For up-to-date donation totals by team, click here. My trick or treating (Oops, my daughter's that is) should be done by then, so I hope to tune in. 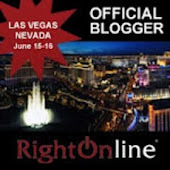 Andrea Shea King blogs at The Radio Patriot. Denver Post columnist David Harsanyi performed a great service in spreading the word regarding the injustice Thomas Klocek encountered from DePaul University when he tried to defend Israel from spurious attacks from some Muslim students at a 2004 student activities fair. While appearing on the O'Reilly Factor in 2005, he brought up the Klocek affair during a discussion about Ward Churchill, who was fired this summer for academic misconduct. And from writing a column to writing a book is where Harsanyi has gone, and the result is out, Nanny State: How Food Fascists, Teetotaling Do-Gooders, Priggish Moralists, and other Boneheaded Bureaucrats are Turning America into a Nation of Children. Trans fat next to be banned in Chicago?